Pure beer bliss, otherwise known as Oktoberfest, is here at last. Sure, there are crowded festivals replete with 1oz pours, lines, and questionable bathrooms, but there are ALSO great specials going on at some of your favorite bars and restaurants. Here are five places worth prost-ing up. Get it?! Celebrating "Bocktoberfest" at The Fainting Goat couldn’t be more perfect, because "bock" means goat in German. Wrap your head around that while you glug $5 German brews and $8 grilled goatwursts (topped with beer-braised onions) from acclaimed Chef Nathan Beauchamp. 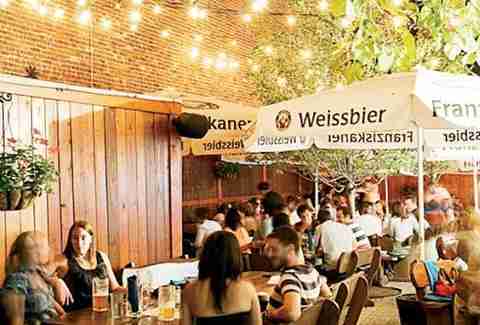 Beers include Erdinger Oktoberfest, Bitburger Pilsner, Pinkus Organic Pilsner, and a rotating selection of other Oktoberfest and bock beers. You can also get 17oz bottles of tasty Ayinger Weizenbock for $8. The special runs through October 5th. Apologies in advance for making this beloved spot even more crowded during the best month of the year. Dacha is OF COURSE getting in on Oktoberfest action by serving Weihenstephaner Oktoberfestbier. 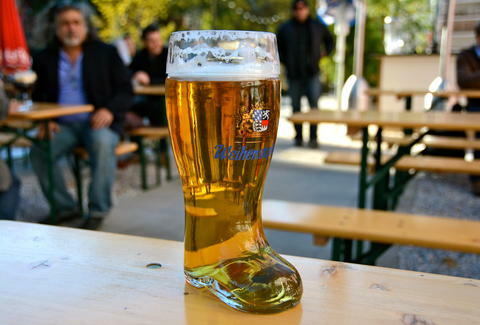 Visit at happy hour and you can get it for $5 a glass or $10 a boot from 4-7pm on Mon-Fri throughout October. Expect to see staff in full-blown lederhosen and dirndls, and don’t forget that they now serve brats and pretzels. When you weren’t looking, Bar Dupont’s cozy outdoor patio, located smack dab on Dupont Circle, transformed into a full-on biergarten. 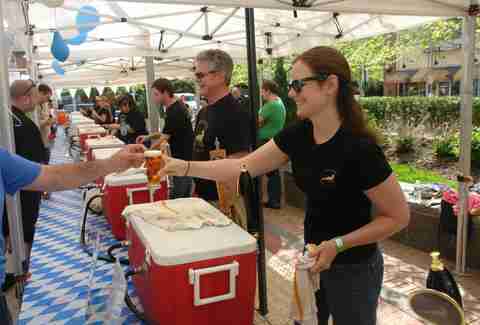 They’re pouring Paulaner Hefe-Weizen, Oktoberfest & Pilsner, and some Spaten Oktoberfest. Be sure to grab sausages hot off the grill and dip them in an array of German mustards. Live polka music from Liab' und Schneid (SO fun to pronounce) and other bands will help you forget that you’re not actually in Bavaria. The fun starts daily at noon, and runs through Sunday, Sept 28th. Virginia's Mad Fox Brewing Company wishes you a "Hoppy Oktoberfest" on Saturday, Sept 27th, with an IPA-inspired outdoor party. The brewery is taking over the market square, so you can try 60 super hoppy or super Oktoberfesty beers set to live music. Purchasing a Mad Fox tasting glass for $20 gets you six food and drink tickets. The event runs from 12-6pm. More info here. Sundays during Oktoberfest, the bar (and its excellent enclosed patio) runs all-day happy hour specials on Spaten and Beck's Oktoberfest ($5 half liter; $10 liters), along with select shots. Saturdays, stop by for live music and even more specials after 5pm. 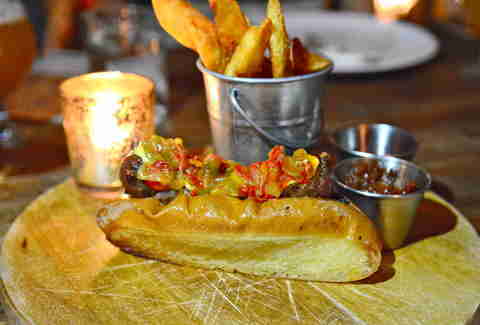 You’ll be eating brat dogs, loaded fries, sliders, and wings. 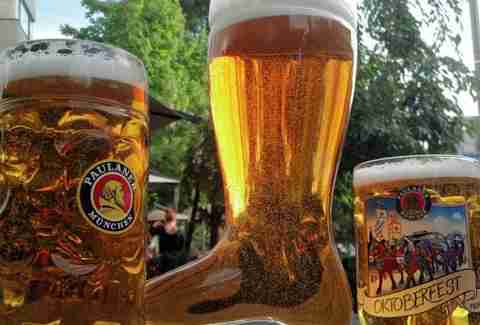 There’s more: now through New Years Day, you can pay $10 to enter a raffle to win a trip to Munich’s Paulaner Salvator Festival (money raised goes to Wounded Warrior Project! ).